Continuous cardiovascular monitoring as part of management of high-risk surgical patients is widely practiced, however the role of continuous monitoring as part of routine management in low-risk surgical patients is unclear. Our aim was to investigate haemodynamic and Bispectral Index (BIS) changes in healthy patients undergoing surgery following induction of anaesthesia with propofol using a continuous non-invasive blood pressure device (LiDCO rapid™). We sought to obtain detailed monitoring of cardiovascular parameters from the pre-induction stage. This prospective, observational single-centre study was conducted at a London teaching hospital between June-November 2014. Patients aged between 18-45 years, American Society of Anesthesiologists grade I-II undergoing elective lower-limb arthroscopic procedures were included. Variables including heart rate (HR), mean arterial pressure (MAP), stroke volume (SV), cardiac output (CO), systemic vascular resistance (SVR) and BIS were recorded continuously prior to induction and up to 3-minutes after. The following relative haemodynamic changes were noted between baseline and 1-minute post-induction with propofol: CO +15.2%, HR +10.1%, SVR -22.9% and MAP -10.1% (p<0.001 for each parameter). There was a mean change of: HR -10.1%, CO -14% and MAP -18.0%(p<0.001 for each parameter) between baseline and 3-minutes post-induction. Median change of BIS was -61.7% (p<0.001) between baseline and 3-minutes post-induction. Significant, positive correlations were noted between MAP and BIS at 30-seconds (r=0.60, p<0.001) and 1-minute post-induction (r=0.61, p<0.001). Our study shows that healthy patients undergoing continuous minimally invasive orthopaedic surgery experience significant haemodynamic and BIS changes following induction of anaesthesia. Our findings highlight the importance of baseline cardiovascular and BIS monitoring as part of routine perioperative management. 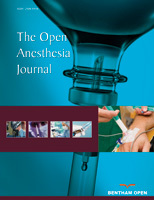 Keywords: Monitoring- depth of anaesthesia, Surgery- orthopaedic, Anaesthesia- general, Anaesthetics I.V.- propofol. © 2017 Hua et al. Continuous cardiovascular monitoring is a key component of goal directed therapy guidelines for management of high-risk surgical patients. Lai et al. measured cardiac output in patients undergoing major abdominal surgery, but this was not obtained at baseline for cardiovascular optimization in the intraoperative period [1Lai CW, Starkie T, Creanor S, et al. Randomized controlled trial of stroke volume optimization during elective major abdominal surgery in patients stratified by aerobic fitness. Br J Anaesth 2015; 115(4): 578-89. [http://dx.doi.org/10.1093/bja/aev299] [PMID: 26385666] ]. Current studies show significant cardiovascular parameters changes that occur during period of anaesthesia maintenance [2Cecconi M, Corredor C, Arulkumaran N, et al. Clinical review: Goal-directed therapy-what is the evidence in surgical patients? The effect on different risk groups. Crit Care 2013; 17(2): 209. 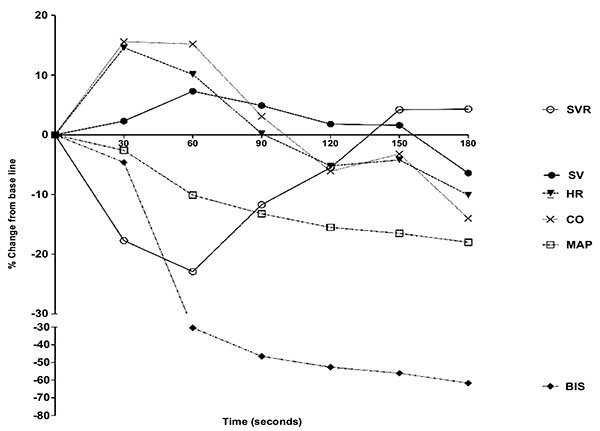 [http://dx.doi.org/10.1186/cc11823] [PMID: 23672779] -5Mayer J, Boldt J, Mengistu AM, Röhm KD, Suttner S. Goal-directed intraoperative therapy based on autocalibrated arterial pressure waveform analysis reduces hospital stay in high-risk surgical patients: A randomized, controlled trial. Crit Care 2010; 14(1): R18. [http://dx.doi.org/10.1186/cc8875] [PMID: 20156348] ]. Since early times, Green et al. demonstrated that it is the fall of cardiac output, and not changes in the systemic vascular resistance that was responsible for changes in blood pressure at induction [6Green D, Bidd H, Rashid H. Multimodal intraoperative monitoring: An observational case series in high risk patients undergoing major peripheral vascular surgery. Int J Surg 2014; 12(3): 231-6. [http://dx.doi.org/10.1016/j.ijsu.2013.12.016] [PMID: 24412536] ]. This findings were later confirmed by Petrun and Kamenik [7Möller Petrun A, Kamenik M. Bispectral index-guided induction of general anaesthesia in patients undergoing major abdominal surgery using propofol or etomidate: A double-blind, randomized, clinical trial. Br J Anaesth 2013; 110(3): 388-96. [http://dx.doi.org/10.1093/bja/aes416] [PMID: 23166149] ]. The relevance of these studies in clinical practice when optimizing patients perioperatively under general anaesthesia is still controversial. Clearly, there is a need to obtain cardiovascular parameters at baseline in the pre-induction phase, which can be used subsequently to individualise anaesthesia management and maintenance of balanced anaesthesia in the intraoperative period. Traditional methods of haemodynamic monitoring have required invasive techniques such as pulmonary artery thermodilution technique using pulmonary artery catheters [8Saugel B, Cecconi M, Wagner JY, Reuter DA. Noninvasive continuous cardiac output monitoring in perioperative and intensive care medicine. Br J Anaesth 2015; 114(4): 562-75. [http://dx.doi.org/10.1093/bja/aeu447] [PMID: 25596280] ], which have precluded many anaesthetists to use continuous cardiac output monitoring during general anaesthesia. In the last decade, non- and minimally- invasive continuous cardiovascular monitoring technology has become available. LiDCOrapid™ equipment which can incorporate the CNAP finger continuous non-invasive pressure monitoring device (CN systems, Graz, Austria) is able to provide haemodynamic monitoring in combination with Bispectral Index (BIS, Medtronic, USA) monitoring (Figs. 1 -4 ). This has potential to replace the current practice of intermittent non-invasive blood pressure measurements using an arm cuff, with the added benefit of measuring haemodynamic parameters such as; Cardiac Output (CO), Systemic Vascular Resistance (SVR), Stroke Volume (SV) and BIS in combination. Propofol is a routine hypnotic agent used in the induction stages of anaesthesia, however can be associated with severe cardio-respiratory depression [9Muzi M, Berens RA, Kampine JP, Ebert TJ. Venodilation contributes to propofol-mediated hypotension in humans. Anesth Analg 1992; 74(6): 877-83. [http://dx.doi.org/10.1213/00000539-199206000-00017] [PMID: 1595920] ]. In patients with poor cardiovascular reserve and elderly population, brief changes in cardiovascular function have the potential to cause adverse events in the perioperative period. Venodilatation accounts for 70% of haemodynamic changes in the intraoperative period [6Green D, Bidd H, Rashid H. Multimodal intraoperative monitoring: An observational case series in high risk patients undergoing major peripheral vascular surgery. Int J Surg 2014; 12(3): 231-6. [http://dx.doi.org/10.1016/j.ijsu.2013.12.016] [PMID: 24412536] ]. If these changes are easily identifiable and treated, we could prevent avoidable complications. This prospective, observational study aims to determine the haemodynamic response, measured by a continuous minimally invasive cardiac output monitoring device LiDCO rapid™, to general anaesthesia in a cohort of healthy volunteers undergoing elective orthopaedic procedures to negate confounding factors, which could influence cardiovascular response to anaesthesia such as hypertension, diabetes mellitus and ischaemic heart disease. Research ethical approval was obtained from the West Midlands Research Ethics Committee (NHS REC ID: 14/WM/0179, IRAS project ID: 156151). The study was conducted according to the UK Good Clinical Practice. This prospective, observational single-centre study was conducted at Chelsea and Westminster Hospital, London, United Kingdom from June 2014 to November 2014. Patients included in the study were those aged 18-45 years undergoing elective lower limb arthroscopic procedures with an American Society of Anesthesiologists (ASA) Grade of I-II. Exclusion criteria were patients that were unable to provide valid informed consent, patients undergoing regional anaesthesia, patients that have contraindications to the LiDCO rapid™ CNAP monitoring (cardiac arrhythmias, aortic regurgitation and digital ischaemia) and BIS monitoring (hypersensitivity to adhesive use) and refusal of surgical, anaesthetic or operating theatre team. Orthopaedic surgical teams, anaesthetists and theatre staff were made aware of this study. Prospective subjects that met our inclusion criteria were identified from the hospital operating theatre’s database two weeks prior to surgery. A letter, which contained the study’s objectives and methods, was sent out to all patients. All study participants provided written informed consent. Continuous minimally invasive cardiac output monitoring was performed using LiDCO rapid™ CNAP device, which measures blood pressure via an inflatable cuff wrapped around the proximal phalanx of the middle and index fingers. The arterial pressure waveform generated was used to derive various haemodynamic parameters using PulseCO™ algorithm. LiDCO™ CNAP and BIS monitoring were attached prior to induction of anaesthesia in the anaesthetic room of the operating theatre. A standardised anaesthetic technique was used for every participant, consisting of propofol induction, sevoflurane maintenance to a target BIS (40-60) and opioid analgesia with fentanyl. Participants underwent positive pressure ventilation to a tidal volume of 8 ml/kg. Measurements of the following variables were taken continuously from pre-induction to time of extubation: heart rate, mean arterial blood pressure, stroke volume, cardiac output, systemic vascular resistance and BIS. Data recorded up to 3 minutes following propofol injection was analysed to capture the post-induction period. Further measurements were taken in recovery room. The total quantity and type of fluids, drugs administered, time of tourniquet application and removal (if performed), and the duration of the operation were recorded. A sample size of 33 patients was required to identify a 30% fall in blood pressure after induction of general anaesthesia. Seven additional patients were recruited to account for technical issues, drop-outs or cancellations. All haemodynamic parameter data was expressed as absolute values and percentage change from baseline measurements taken prior to the time of anaesthetic induction. Induction was defined as the time at which propofol was administered. Continuous variables were expressed as mean (±SD) and compared at each time point with baseline measurements with One-way ANOVA. In order to test for significant differences with non-parametric data, repeated measures data, the Friedman test was used. Statistical significance was defined by a P value < 0.05. Statistical analyses were performed with SPSS (IBM® SPSS® Statistics 22, SPSS Inc., IBM Corporation, Armonk, NY, USA). Thirty-three patients were included for the analysis of study data. Mean patient age was 32 (±6.9) with 22 (66.6%) patients being male and 11 (33.3%) female. Patients were a mixture of ASA grade I (84.8%) and ASA grade II (15.2%). Other demographic data can be seen in Table 1. The most common procedures performed were anterior cruciate ligament (ACL) repair (27.3%) and arthroscopy (21.2%) (see appendix for all procedures). The overall mean operating time was 78 minutes (±40.1). Average doses of propofol and fentanyl given at induction to each patient were 3.5 mg/kg (±1.3) and 1.6 mcg/kg (±0.7) respectively. Patient demographic data. Continuous variables reported as mean ± (SD) and *categorical data as n (%). Time-points after induction were expressed as Induction (i) + seconds (s) following. Mean Arterial Pressure (MAP) demonstrated a sustained decrease after induction, with the lowest recorded change from baseline of -18% (p<0.001) at time i180. Heart rate initially increased from baseline by 14.6% (p<0.001) and 10.1% at times i30(s) and i60s respectively, before gradually decreasing to -10% (p<0.001) from baseline at i180. A similar trend was noted with cardiac output, whereby there was an increase of 15.6% and 15.2% at times i30 and i60 after induction before decreasing to -14% at time i180 compared to CO prior to induction. Change in CO at each time point measured compared to baseline was not statistically significant. However, there were no statistically significant differences of stroke volume measured at any time point following induction of anaesthesia (p=0.22). The lowest recorded systemic vascular resistance was observed at time i60, -22.9% (p<0.001) from baseline, after which there was a gradual increase to 4.3% (p=0.57) above baseline at i180. In all cases as expected BIS decreased to a significantly lower value than the baseline reading taken prior to induction of anaesthesia. The lowest measure of -61.7% (p<0.001) below baseline was recorded at i180(s). Absolute change in stroke volume (SV), mean arterial pressure (MAP), heart rate (HR), bispectral index (BIS) and cardiac output (CO) plotted against time (seconds) after induction with propofol with best fit linear regression line. Relative changes (%) in systemic vascular resistance (SVR), stroke volume (SV), heart rate (HR), cardiac output (CO), mean arterial pressure (MAP) and bispectral index (BIS). 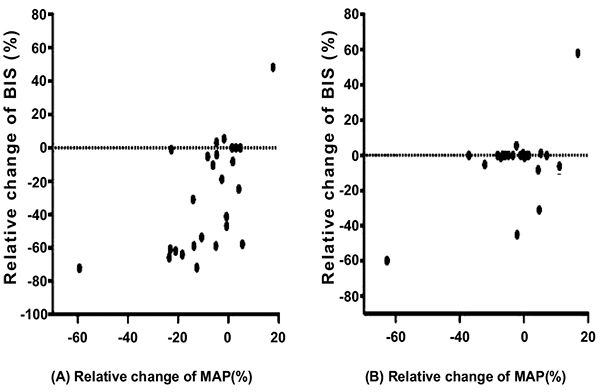 (A) Association between relative change (%) in bispectral index (BIS) and relative change (%) in mean arterial pressure (MAP) at 30 seconds post induction with propofol, r =0.60 (p<0.001) (B) Association between relative change (%) in bispectral index (BIS) and relative change (%) in mean arterial pressure (MAP) at 60 seconds post induction with propofol, r= 0.61 (p<0.001). Absoluete heart rate (HR), stroke volume (SV), cardiac output (CO), mean arterial pressure (MAP), systemic vascular resistance (SVR), bispectral index (BIS) at pre-induction and 30, 60, 90, 120, 150 and 180 seconds (s) after induction. Data are mean (SD). **Data is median (IQR). * indicates a significant difference (p<0.001) in parameter compared to pre-induction. Our results demonstrate significant changes in haemodynamic response following induction of general anaesthesia. This study demonstrated similar findings to one conducted by Price et al. on ASA Grade I patients using Doppler ultrasound as a tool of cardiovascular monitoring; where a transient increase in HR and CO was observed followed by a decrease in these parameters from baseline [10Price ML, Millar B, Grounds M, Cashman J. Changes in cardiac index and estimated systemic vascular resistance during induction of anaesthesia with thiopentone, methohexitone, propofol and etomidate. Br J Anaesth 1992; 69(2): 172-6. [http://dx.doi.org/10.1093/bja/69.2.172] [PMID: 1389822] ]. Similarly, we noted a decrease in MAP following induction and this is likely attributed to redistribution from venodilation as aforementioned [6Green D, Bidd H, Rashid H. Multimodal intraoperative monitoring: An observational case series in high risk patients undergoing major peripheral vascular surgery. Int J Surg 2014; 12(3): 231-6. [http://dx.doi.org/10.1016/j.ijsu.2013.12.016] [PMID: 24412536] ]. This demonstrates that non-invasive cardiovascular monitoring can be used as a favorable method in patients undergoing surgery. Further comparison of our results and other studies [11Claeys MA, Gepts E, Camu F. Haemodynamic changes during anaesthesia induced and maintained with propofol. Br J Anaesth 1988; 60(1): 3-9. [http://dx.doi.org/10.1093/bja/60.1.3] [PMID: 3257393] , 12Coates DP, Monk CR, Prys-Roberts C, Turtle M. Hemodynamic effects of infusions of the emulsion formulation of propofol during nitrous oxide anesthesia in humans. Anesth Analg 1987; 66(1): 64-70. [http://dx.doi.org/10.1213/00000539-198701000-00011] [PMID: 3492156] ] has demonstrated a difference in significance of heart rate changes following induction. We have also demonstrated that changes in depth of anaesthesia, as measured by BIS levels show a similar trend to changes in haemodynamic parameters. This is also supported by an observational case series in high-risk patients undergoing major vascular surgery [6Green D, Bidd H, Rashid H. Multimodal intraoperative monitoring: An observational case series in high risk patients undergoing major peripheral vascular surgery. Int J Surg 2014; 12(3): 231-6. Clinical trials that have studied haemodynamic responses following general anaesthesia lack pre-induction baseline readings and absolute changes, which could potentially change the way patients are managed in the perioperative period. Most clinicians manage patients mainly by observing the changes that occur intra-operatively without knowing cardiovascular parameters at baseline. We feel that perhaps doing so without fully knowing an individual patient’s physiology could potentially lead to increased perioperative complications. This is supported by work done by Wolff et al. which suggests that maintaining cardiac output at, or close to, levels as measured prior to induction is likely to be a good reflection of adequate cardiac output and oxygen delivery [13Wolff CB, Green DW. Clarification of the circulatory patho-physiology of anaesthesia Implications for high-risk surgical patients. Int J Surg 2014; 12(12): 1348-56. Whilst our study show a significant increase in heart rate following anaesthetic induction [10Price ML, Millar B, Grounds M, Cashman J. Changes in cardiac index and estimated systemic vascular resistance during induction of anaesthesia with thiopentone, methohexitone, propofol and etomidate. Br J Anaesth 1992; 69(2): 172-6. [http://dx.doi.org/10.1093/bja/69.2.172] [PMID: 1389822] ], others have reported no significant differences [11Claeys MA, Gepts E, Camu F. Haemodynamic changes during anaesthesia induced and maintained with propofol. Br J Anaesth 1988; 60(1): 3-9. [http://dx.doi.org/10.1213/00000539-198701000-00011] [PMID: 3492156] ]. It has been hypothesised that propofol potentially exerts a central vagal predominance when administered [11Claeys MA, Gepts E, Camu F. Haemodynamic changes during anaesthesia induced and maintained with propofol. Br J Anaesth 1988; 60(1): 3-9. [http://dx.doi.org/10.1093/bja/60.1.3] [PMID: 3257393] ]. However, the other studies which found no significant change in heart rate following induction of anaesthesia investigated patients aged >40 and of ASA Grade II and Grade III. One of the possible explanations could be that heart rate variability and the stress response to surgery and anaesthesia may be impaired in older patients. Another plausible variables that could influence the diversity of results in the subject is patients randomized in previous studies had been on medications such as β-blockers or have pre-existing cardiac diseases, which makes the tachycardic response following propofol induction difficult to mount. Other studies have also studied haemodynamic changes and post-operative complications in patients undergoing hip surgery. However, in these studies, patients have undergone spinal anaesthesia and not general anaesthesia [14Moppett IK, Rowlands M, Mannings A, Moran CG, Wiles MD. LiDCO-based fluid management in patients undergoing hip fracture surgery under spinal anaesthesia: A randomized trial and systematic review. Br J Anaesth 2015; 114(3): 444-59. From a physiological point of view, the need for perioperative monitoring is base on the concept of adequate oxygen delivery to tissues intra-operatively to avoid oxygen debt in the post-operative period, which can lead to cardio-pulmonary complications. Inadequate blood volume occurs as a result of venodilatation following anaesthesia [13Wolff CB, Green DW. Clarification of the circulatory patho-physiology of anaesthesia Implications for high-risk surgical patients. Int J Surg 2014; 12(12): 1348-56. [http://dx.doi.org/10.1016/j.ijsu.2014.10.034] [PMID: 25448657] ]. In clinical practice, perioperative monitoring especially in high-risk surgical patients has sometimes been shown to improve patient outcomes, reduce the length of hospital stay and financial costs [15Noblett SE, Snowden CP, Shenton BK, Horgan AF. 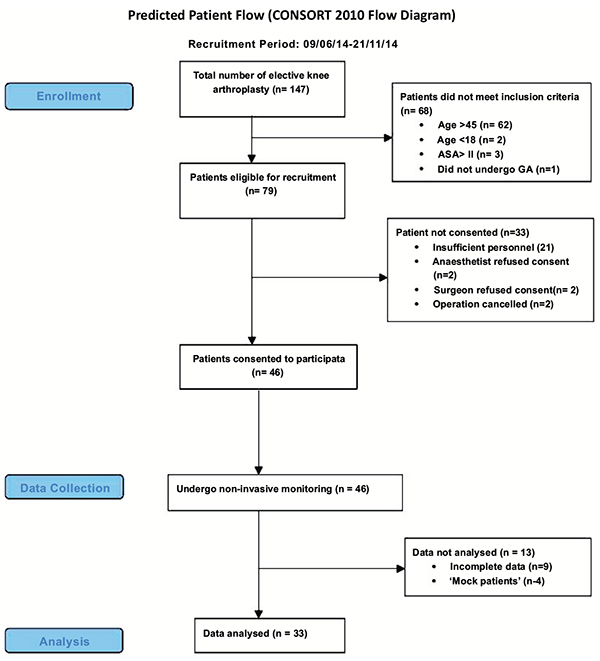 Randomized clinical trial assessing the effect of Doppler-optimized fluid management on outcome after elective colorectal resection. Br J Surg 2006; 93(9): 1069-76. [http://dx.doi.org/10.1002/bjs.5454] [PMID: 16888706] ]. Mortality is one outcome that has not been shown to be reduced by perioperative monitoring [16Grocott MP, Dushianthan A, Hamilton MA, Mythen MG, Harrison D, Rowan K. Perioperative increase in global blood flow to explicit defined goals and outcomes after surgery: A cochrane systematic review. Br J Anaesth 2013; 111(4): 535-48. The magnitude of change in BIS levels seen in our patients was significant and could be due to cortical depression by propofol but the reduction in MAP could potentially be a cofounding factor. The fall in MAP may have contributed a transient leading to a reduction in Cerebral Perfusion Pressure (CPP). MAP and intracranial pressure (ICP) are both parameters required to calculate the CPP (CPP = MAP - ICP). In a study by Ravussin et al. [17Ravussin P, Guinard JP, Ralley F, Thorin D. Effect of propofol on cerebrospinal fluid pressure and cerebral perfusion pressure in patients undergoing craniotomy. Anaesthesia 1988; 43(Suppl. ): 37-41. [http://dx.doi.org/10.1111/j.1365-2044.1988.tb09066.x] [PMID: 3259094] ], a significant decrease in ICP was noted after propofol induction. The fall in MAP in our study may have counted towards a decrease in CPP and contributed to further cortical depression. These combined effects of propofol and significant haemodynamic changes after induction of anaesthesia in healthy young patients undergoing surgery under general anaesthesia further emphasise the need to monitor such changes prior to and during the induction stages of anaesthesia. BIS levels of <40 have been associated with post-operative cognitive decline and delirium, especially in the elderly [18Chan MT, Cheng BC, Lee TM, Gin T. BIS-guided anesthesia decreases postoperative delirium and cognitive decline. J Neurosurg Anesthesiol 2013; 25(1): 33-42. [http://dx.doi.org/10.1097/ANA.0b013e3182712fba] [PMID: 23027226] ]. Multimodal intraoperative monitoring including cerebral and haemodynamic monitoring have previously been demonstrated to reduce morbidity and mortality in high-risk patients [13Wolff CB, Green DW. Clarification of the circulatory patho-physiology of anaesthesia Implications for high-risk surgical patients. Int J Surg 2014; 12(12): 1348-56. A recent study by the vascular events in non-cardiac surgery patients cohort evaluation (VISION) group quoted 8% of patients over 45 suffer from myocardial injury as defined by a rise in Troponin T after non-cardiac surgery (MINS) and was that this was an independent predictor of 30-day mortality [19Botto F, Alonso-Coello P, Chan MT, et al. Myocardial injury after noncardiac surgery: A large, international, prospective cohort study establishing diagnostic criteria, characteristics, predictors, and 30-day outcomes. Anesthesiology 2014; 120(3): 564-78. [http://dx.doi.org/10.1097/ALN.0000000000000113] [PMID: 24534856] ]. In addition, studies conducted by Wash et al. and Monk et al. showed that short period of low blood pressure could be deleterious, resulting in poor outcome [20Monk TG, Bronsert MR, Henderson WG, et al. Association between intraoperative hypotension and hypertension and 30-day postoperative mortality in noncardiac surgery. Anesthesiology 2015; 123(2): 307-19. [http://dx.doi.org/10.1097/ALN.0000000000000756] [PMID: 26083768] , 21Walsh M, Devereaux PJ, Garg AX, et al. Relationship between intraoperative mean arterial pressure and clinical outcomes after noncardiac surgery: toward an empirical definition of hypotension. Anesthesiology 2013; 119(3): 507-15. [http://dx.doi.org/10.1097/ALN.0b013e3182a10e26] [PMID: 23835589] ]. The MINS cohort is likely to represent a mixed aetiology for ischaemia that may range from myocardial hypoperfusion, to acute plaque instability and rupture. Periods of hypotension that occur during induction of anaesthesia or intraoperative factors such as hypovolaemia result in the imbalance of oxygen-demand and supply and might lead to myocardial injury and type-2 myocardial infarction. Patients with pre-existing asymptomatic coronary disease and poor cardiovascular reserves are especially susceptible to the direct effects of general anaesthesia, further emphasising the need for pre-induction monitoring. If such significant haemodynamic changes are being observed in our cohort of healthy young patients, then monitoring the older patients and high-risk patients from the pre-induction of anaesthesia may be even more necessary. By clarifying the physiological changes that take place in healthy young volunteers which have negated ‘external factors’ such as medications, different oxygen delivery rates, and poor physiological reserves, we can better understand and interpret these changes in older patients. Although the invasive method of thermo-dilution remains gold standard in CO estimation, the role of minimally invasive beat-to-beat cardiac output monitoring technology is increasingly being utilised for obvious reasons; it carries substantially less risk, is commercially widely available and can be used to guide medical decision making more simply. More importantly, this technology has been validated in a number of studies [22Fortin J, Habenbacher W, Heller A, et al. Non-invasive beat-to-beat cardiac output monitoring by an improved method of transthoracic bioimpedance measurement. Comput Biol Med 2006; 36(11): 1185-203. [http://dx.doi.org/10.1016/j.compbiomed.2005.06.001] [PMID: 16131462] , 23OLoughlin E, Ward M, Crossley A, Hughes R, Bremner AP, Corcoran T. Evaluation of the utility of the Vigileo FloTrac TM, LiDCO TM, USCOM and CardioQ TM to detect hypovolaemia in conscious volunteers: A proof of concept study. Anaesthesia 2015; 70(2): 142-9. We recognise that measurements of baseline haemodynamic parameters in the anaesthetic room immediately prior to induction as a limitation, Table 2. Patient anxiety prior to surgery may possibly have led to baseline recordings not reflecting patients’ true baseline readings. Future work would consider several baseline BP and HR measurements prior to surgery in a less anxiety-inducing environment e.g. home and or surgery of general practitioners and data feed automatically into patients’ electronic medical records in hospitals. Controlling MAP during induction of anaesthesia to rule out its link to cerebral perfusion and further cortical depression during induction of general anaesthesia with propofol seems a logical step to take. Finally individualised optimisation of the cardiovascular system during delivery of balanced anaesthesia and long-term outcome would be considered. In summary, our study showed significant changes of haemodynamic response to induction of general anaesthesia in young healthy patients who underwent elective orthopaedic surgery. Further work is warrant to identify the link between low MAP and cortical depression under general anaesthesia. The experiments were in accordance with ethical standards of the committee responsible for human experimentation (Institutional and National) and the Helsinki declaration of 1975. No Animals were used in the study. The authors specially that Fund 556, CW-FT+ for partially funded this project and they are thankful to LIDCO and COVIDIEN for providing monitors to conduct the study. Lai CW, Starkie T, Creanor S, et al. Randomized controlled trial of stroke volume optimization during elective major abdominal surgery in patients stratified by aerobic fitness. Br J Anaesth 2015; 115(4): 578-89. Cecconi M, Corredor C, Arulkumaran N, et al. Clinical review: Goal-directed therapy-what is the evidence in surgical patients? The effect on different risk groups. Crit Care 2013; 17(2): 209. Jhanji S, Vivian-Smith A, Lucena-Amaro S, Watson D, Hinds CJ, Pearse RM. Haemodynamic optimisation improves tissue microvascular flow and oxygenation after major surgery: A randomised controlled trial. Crit Care 2010; 14(4): R151. Benes J, Chytra I, Altmann P, et al. Intraoperative fluid optimization using stroke volume variation in high risk surgical patients: Results of prospective randomized study. Crit Care 2010; 14(3): R118. Mayer J, Boldt J, Mengistu AM, Röhm KD, Suttner S. Goal-directed intraoperative therapy based on autocalibrated arterial pressure waveform analysis reduces hospital stay in high-risk surgical patients: A randomized, controlled trial. Crit Care 2010; 14(1): R18. Green D, Bidd H, Rashid H. Multimodal intraoperative monitoring: An observational case series in high risk patients undergoing major peripheral vascular surgery. Int J Surg 2014; 12(3): 231-6. Möller Petrun A, Kamenik M. Bispectral index-guided induction of general anaesthesia in patients undergoing major abdominal surgery using propofol or etomidate: A double-blind, randomized, clinical trial. Br J Anaesth 2013; 110(3): 388-96. Saugel B, Cecconi M, Wagner JY, Reuter DA. Noninvasive continuous cardiac output monitoring in perioperative and intensive care medicine. Br J Anaesth 2015; 114(4): 562-75. Muzi M, Berens RA, Kampine JP, Ebert TJ. Venodilation contributes to propofol-mediated hypotension in humans. Anesth Analg 1992; 74(6): 877-83. Price ML, Millar B, Grounds M, Cashman J. Changes in cardiac index and estimated systemic vascular resistance during induction of anaesthesia with thiopentone, methohexitone, propofol and etomidate. Br J Anaesth 1992; 69(2): 172-6. Claeys MA, Gepts E, Camu F. Haemodynamic changes during anaesthesia induced and maintained with propofol. Br J Anaesth 1988; 60(1): 3-9. Coates DP, Monk CR, Prys-Roberts C, Turtle M. Hemodynamic effects of infusions of the emulsion formulation of propofol during nitrous oxide anesthesia in humans. Anesth Analg 1987; 66(1): 64-70. Wolff CB, Green DW. Clarification of the circulatory patho-physiology of anaesthesia Implications for high-risk surgical patients. Int J Surg 2014; 12(12): 1348-56. Moppett IK, Rowlands M, Mannings A, Moran CG, Wiles MD. LiDCO-based fluid management in patients undergoing hip fracture surgery under spinal anaesthesia: A randomized trial and systematic review. Br J Anaesth 2015; 114(3): 444-59. Noblett SE, Snowden CP, Shenton BK, Horgan AF. Randomized clinical trial assessing the effect of Doppler-optimized fluid management on outcome after elective colorectal resection. Br J Surg 2006; 93(9): 1069-76. Grocott MP, Dushianthan A, Hamilton MA, Mythen MG, Harrison D, Rowan K. Perioperative increase in global blood flow to explicit defined goals and outcomes after surgery: A cochrane systematic review. Br J Anaesth 2013; 111(4): 535-48. Ravussin P, Guinard JP, Ralley F, Thorin D. Effect of propofol on cerebrospinal fluid pressure and cerebral perfusion pressure in patients undergoing craniotomy. Anaesthesia 1988; 43(Suppl. ): 37-41. Chan MT, Cheng BC, Lee TM, Gin T. BIS-guided anesthesia decreases postoperative delirium and cognitive decline. J Neurosurg Anesthesiol 2013; 25(1): 33-42. Botto F, Alonso-Coello P, Chan MT, et al. Myocardial injury after noncardiac surgery: A large, international, prospective cohort study establishing diagnostic criteria, characteristics, predictors, and 30-day outcomes. Anesthesiology 2014; 120(3): 564-78. Monk TG, Bronsert MR, Henderson WG, et al. Association between intraoperative hypotension and hypertension and 30-day postoperative mortality in noncardiac surgery. Anesthesiology 2015; 123(2): 307-19. Walsh M, Devereaux PJ, Garg AX, et al. Relationship between intraoperative mean arterial pressure and clinical outcomes after noncardiac surgery: toward an empirical definition of hypotension. Anesthesiology 2013; 119(3): 507-15. Fortin J, Habenbacher W, Heller A, et al. Non-invasive beat-to-beat cardiac output monitoring by an improved method of transthoracic bioimpedance measurement. Comput Biol Med 2006; 36(11): 1185-203. OLoughlin E, Ward M, Crossley A, Hughes R, Bremner AP, Corcoran T. Evaluation of the utility of the Vigileo FloTrac TM, LiDCO TM, USCOM and CardioQ TM to detect hypovolaemia in conscious volunteers: A proof of concept study. Anaesthesia 2015; 70(2): 142-9.